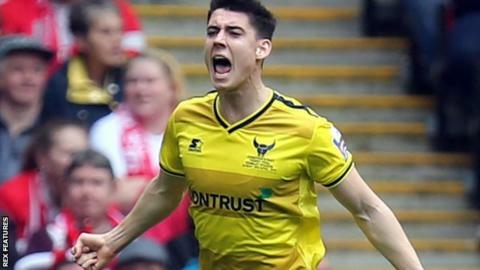 Uncapped Oxford United midfielder Callum O'Dowda has been named in the Republic of Ireland squad for the games against the Netherlands and Belarus. O'Dowda, 21, can play in midfield or attack and has scored 10 goals this season as he helped Oxford achieve promotion to League One. The English-born player has played five times for the Republic's Under-21s. Stoke pair Shay Given and Marc Wilson return after missing the games against Switzerland and Slovakia in March. Wilson, 28, is still not fully fit after sustaining a knee injury in January but the player is understood to be optimistic that he will be available for Euro 2016. Veteran keeper Given, 40, has not played for the Republic since being injured in the Euro 2016 qualifier win over Germany in early October. Squad skipper Robbie Keane returns after missing the Switzerland and Slovakia games because of a knee injury which was later operated on. Striker Kevin Doyle is also named in the squad after sustaining a deep leg gash in the win over Switzerland. Aberdeen's Jonny Hayes retains his place in the squad after earning a first call-up for the games in March. The Republic face the Dutch in Dublin on 27 May before taking on Belarus in Cork four days later. Martin O'Neill's side open their Euro 2016 campaign against Sweden on 13 June before taking on Belgium (18 June) and Italy (22 June).